He Australian box jellyfish is considered the most venomous marine animal. They may not look dangerous, but the sting of a box jellyfish could be enough to send you to Davy Jones's locker-a watery grave, that is. Box jellyfish, named for their body shape, have tentacles covered in biological booby traps known as nematocysts - tiny darts loaded with poison. People and animals unfortunate enough to be injected with this poison may experience paralysis, cardiac arrest, and even death, all within a few minutes of being stung. But don’t choose the mountains over the ocean just yet. 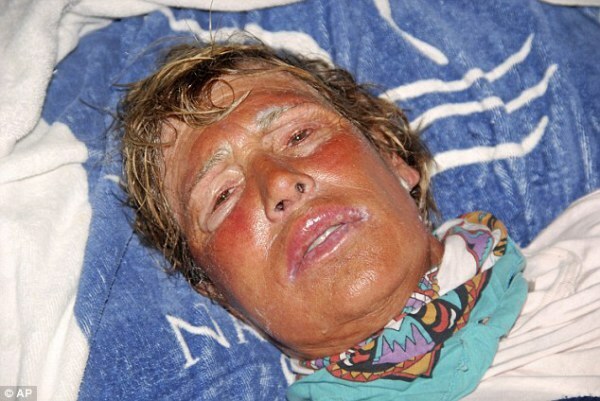 Of the 50 or so species of box jellyfish, also called sea wasps, only a few have venom that can be lethal to humans. While box jellyfish are found in warm coastal waters around the world, the lethal varieties are found primarily in the Indo-Pacific region and northern Australia. 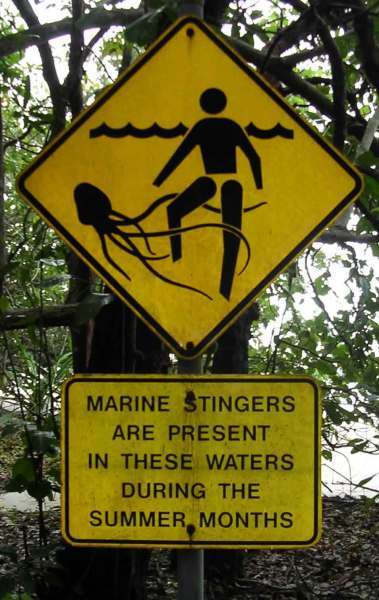 This includes the Australian box jellyfish (Chironex flicker), considered the most venomous marine animal. Chironex flicker is the largest of the box jellyfish, with body sizes reaching up to one foot in diameter and thick, bootlace-like tentacles up to 10 feet long. Box jellyfish have traits that set them apart from other jellyfish. Most notably, box jellyfish can swim—at maximum speeds approaching four knots—whereas most species of jellyfish float wherever the current takes them, with little control over their direction. Box jellyfish can also see. They have clusters of eyes on each side of the box. Some of these eyes are surprisingly sophisticated, with a lens and cornea, an iris that can contract in bright light, and a retina. The most publicised and well-known are the big box jellyfish (most deadly) and the Iru kanji jellyfish and then there are 27 other lesser well-known species. 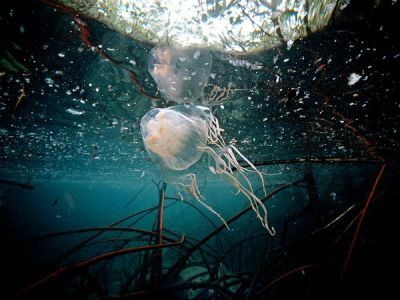 In North Queensland, the big box jellyfish and the Iru kanji are the most common jellyfish seen during ‘stinger season’. It is so venomous it will kill you within two minutes if you receive two metres or more tentacle contact. If a tentacle touches the skin, it results in a very painful sting. This is probably one of the more bizarre things we learned about jellyfish. Apparently their eyes are on the side of their body, and all look inwards as they use their body as a lens to see through. Their eyes are grouped in six lots of four eyes. Scientists have only recently learned that jellyfish settle on the bottom of the ocean floor at night to sleep and then feed during the day. Jellyfish usually eat two to three times a day. 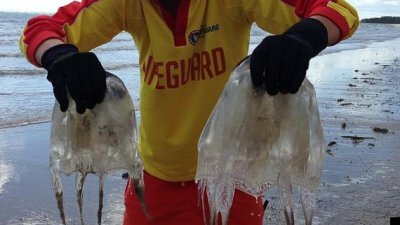 Small jellyfish eat prawns, and big box jellyfish eat fish. However, if they don’t eat, they shrink. 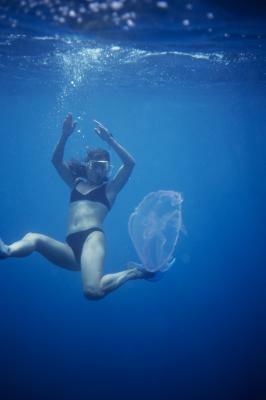 A big box jellyfish can lose up to 30 per cent of its bodyweight in 24 hours if it doesn’t eat. 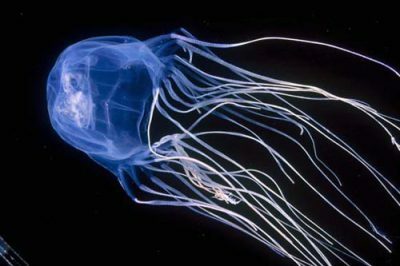 Consequently, the best way to tell the age of a jellyfish is by measuring their eyes and not by the size of their body.